I pulled out my never used Reverse Confetti stamp set and dies and went to work. The background was stamped with the row “X”s and hearts three times using my MISTI. What did I ever do without that tool? A couple of die cuts, a tiny rhinestone heart and done! 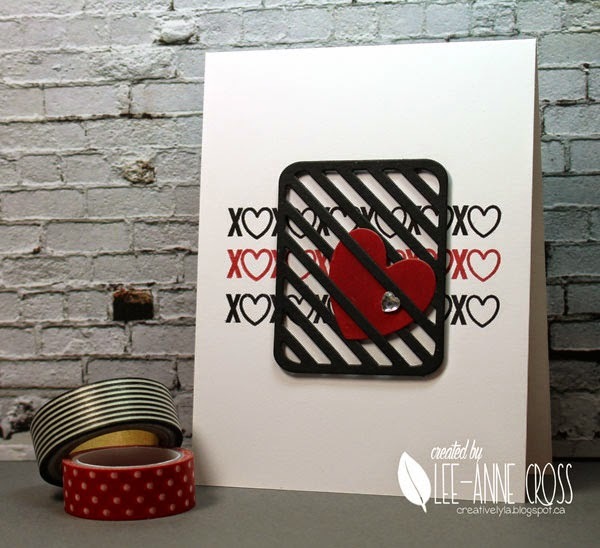 Very cool and funky Valentine's card – could totally work for a guy or gal! Thanks for playing along with CASology this week! This is a great Valentine card and I love the RC! Love this idea for a card! This is so fun! Love the “captured” heart! Previous Previous post: So Thrilled!